I have to be honest and admit that pears are not quite my thing but your photo has still managed to make my mouth water! 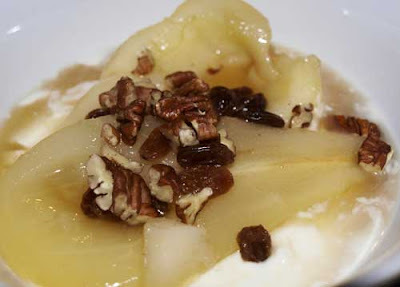 I had the juciest pears ever over the summer which would be delicious with pecans and cranberries. That looks perfect! Great recipe and it's a keeper! I'm going to quit telling you how I read your blog with an accent, but I still do. The pears look lovely darling ~ did that sound good?? Chip chip cheerio! I know, I need to get some rest don't I?? I'm having blog withdrawal not being able to post anything - GRRRRR. I think they said the girl that designed the blogs will be home tonight so fingers crossed! What a great way to use pears. I love making fruit desserts and need to do it more often. Thanks for stopping by my blog and leaving a comment. I really appreciate the visit. I love the sound of these with pecans and cranberries! I bet they were just delicious with the yogurt too.